ECI’s Principles of Technology is a two-year course designed to teach traditional physics using a contextual approach.The full two-year course includes 14 units of instruction that allow students to develop their skills and ability to understand complex theories and processes. Through a blend of technology and academics, students will discover how physics concepts apply to workplace situations. This exciting integrated instructional package employs a system of approach to help students understand physics concepts and mathematics. The first year course presents mechanical, electrical, fluid and thermal systems that demonstrate the basic principles of physics. The second seven units of this applied science course, provide a further understanding of the basic principles of physics in mechanical, fluid, electrical, and thermal systems. More high schools, technical centers, and colleges have chosen ECI’s lab system to implement Technical Physics than any other system available. Energy Concepts applies the knowledge from 50 years of experience to develop educational systems that have a proven record of success in teaching technical subjects. The complete turnkey lab system includes lab management solutions, quality hardware and instrumentation, a comprehensive student lab manual, instructor’s guide, and instructor’s resource manual. 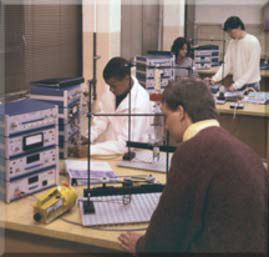 The laboratory equipment allows students to perform experiments on a bench top and to accomplish each experiment with accuracy, repeatability, and speed. The Principles of Technology curriculum provides a solid base of major engineering concepts, math and science. ECI’s laboratory system together with the Principles of Technology curriculum is a solid combination for successful outcomes in your technology-based educational program.